The LAND SHARK ™ has been designed and developed by the professionals at Special Service and Supply to fill an important need for a strong, light weight, powerful, easily controllable, self contained heavy duty extrication and rescue cutter which eliminates the need for power packs, external pumps or batteries. is designed to efficiently deal with tough rescue applications and incorporates many unique features not found in any other cutting tool. works equally well, both on land or under water. accompanying air/hydraulic pump and controls are designed to operate under water, unlike battery and engine powered hydraulic cutting tools. has jaws that open a full 5½” to accept the largest vehicle door and roof posts. 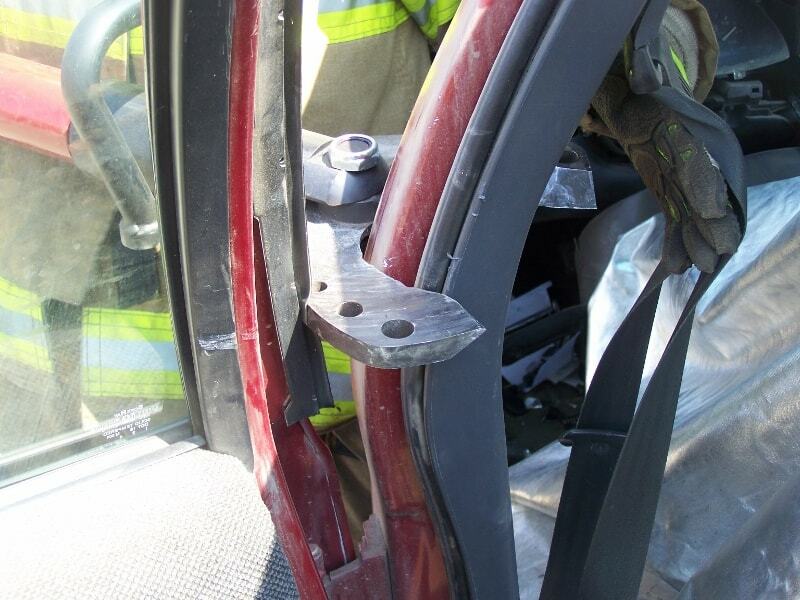 The combination of 10,000 pounds of hydraulic pressure, and exclusive tapered jaw design, combine forces to easily slice thru the “A”, “B”, and “C” posts and roofs of vehicles, steel, aluminum, titanium, fiberglass and other materials to facilitate rapid extrication of accident and machinery entrapment victims. jaws are operated with the use of a simple foot operated positive control valve, located on the air/hydraulic pump, leaving both of the operator’s hands free to position and control the tool, eliminating the confusion, instability and loss of cutting tool control associated with handle mounted controls. utilizes an exclusive air/hydraulic power system or a high efficiency hand pump, eliminating the need for gas or diesel powered generators, hydraulic pumps, or long hydraulic hoses along with their associated starting and maintenance problems, and tripping hazards or the need to carry spare fuel cans, or batteries and chargers required by other cutting tools. provides virtually silent operation of its air/hydraulic pump and optional double acting hand operated pump, promotes safety and efficient scene control, permitting communication between rescue personnel without requiring shouting or hand signals. Lower noise levels at the scene reduce the stress on accident victims as well as on rescue personnel. The air/hydraulic pump operates from SCBA cylinders, SCUBA tanks or on board vehicle breathing air systems, a vehicle’s CAFS system or air brake system. is the only hydraulic cutting tool designed for rescue cutting operations above ground, in confined spaces, below grade level and even underwater. The “exhaust” from the air/hydraulic pump operating from a breathing air cylinder is clean breathable air, eliminating the worry about exhaust fumes, asphyxiation, ignition sources, electric shock and air pollution associated with other tools. is the only hydraulic cutting tool designed to be self contained in it’s operation. The optional light weight aluminum high pressure two stage hand operated pump provides the rescuer with the ability to operate the LAND SHARK without any external power supply for those situations where external power supplies are not available or are not a desirable option. The aluminum hand operated pump complies with ANSI/ASME B30.1 Safety Standard for hydraulic operated equipment. For those situations where the air/hydraulic pump is desired, the rugged factory preset air regulator is manufactured to (Compressed Gas Association) CGA Standards. The regulator operates on any air supply cylinder equipped with a CGA valve, supplying air pressure from 150 P.S.I. to 6,000 P.S.I. without requiring any adjustment by the operator. The air regulator has an unpresidented seven year warranty and incorporates a safety relief valve complying with CGA standards to prevent over pressurization of regulator, hose and the air/hydraulic pump. The air/hydraulic pump is operated by moving the positive positioning, three way control valve using either the operators hand or foot. The control valve is provided with a center “off” position which holds the jaws in position and prevents inadvertent opening or closing of the LAND SHARK ™. A 10,000 P.S.I. hydraulic pressure relief valve meeting ANSI/ASME B30.1 safety standards, is incorporated into the air/hydraulic pump to prevent over pressurization of the LAND SHARK ™ and hoses. The LAND SHARK ™ extrication tool is fully self contained unit when powered by the optional manually operated two stage hand hydraulic pump that provides up to 10,000 P.S.I. of operating pressure for those applications where self contained operation is desired or air supply sources are not readily available. With either hydraulic power system, the LAND SHARK™ meets or exceeds ANSI/ASME B30.1 safety standards for hydraulic operated equipment. 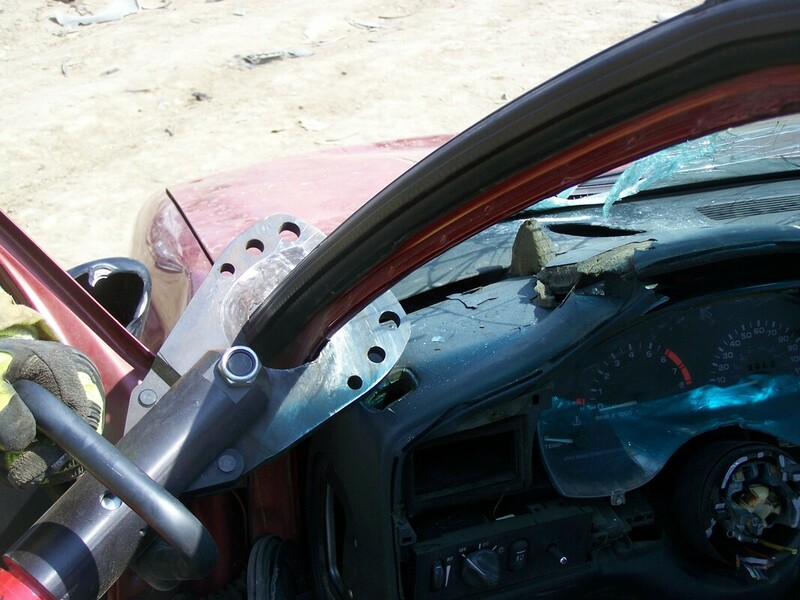 The LAND SHARK ™ extrication tool has been designed to keep the weight and size of the tool to the absolute minimum necessary to provide the greatest amount of cutting force, reliability and ease of operation necessary for rescue operations. Width at widest point: 6 1/2"
Depth of cut: 5 1/4"
Complete set shipping weight: 80 lbs. Ships via FedEx Ground ®. The LAND SHARK facilitates roof removal as it devours another "B" pillar.